Joey Sturgis Tones has released Finality, a limiter plugin declined in two versions - Lite and Advanced. 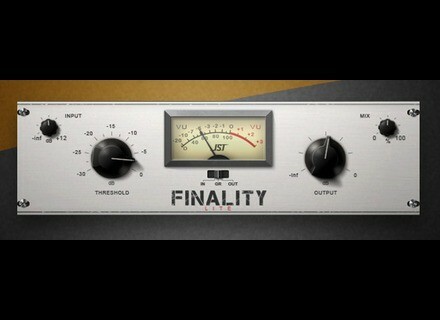 Finality Advanced is a limiter designed to be both powerful and versatile. It is aimed at controlling peak and level dynamics in the mix of both very dynamic sources (like drums and vocals) and more "flat" ones like distorted rhythm guitars and synth. Finality Advanced is available in Windows (32 & 64 bit): VST2, VST3, AAX, RTAS formats for Windows and Mac OSX (+AU for Mac) in 32 and 64-bit (32-bit only for RTAS). It is available now for the introductory price of $69 instead of $89. A minimalist version (named Finality Lite) is also available for the introductory price of $39 (instead of $59), it only features Input, Threshold, Output and Mix settings and has a white GUI very reminiscent of a widely known classic studio compressor. It is also freely included with the purchase of the Advanced version. More details available at JST's website. Get 5% at Joey Sturgis Tones this month As many small streams make one big river (and it's still better than nothing), JST offers a 5% discount on all orders made in January. New one-day offers at JST Today, Joey Sturgis Tones offers two discounts on IR banks, plus extends yesterday's offer on the Ben Bruce Toneforge amp. JST Toneforge Ben Bruce amp 50% off today Today's flash sale at Joey Sturgis Tone gives you the opportunity to get the Toneforge Ben Bruce virtual amp plugin at half price.